Picture us building you a chicken coop. Our coops are safer, last longer and take less of your valuable time! If we sell it... we built it. Your new coop is made right here in our woodworking shop, by hand, by American carpenters. Every one. Model for model our chicken coops are bigger, safer and more roomy than competitor chicken coops. We don't exaggerate capacity. We don't cheat on quality. We use the best materials we can buy. We realize our chicken coops aren't cheap...but they're not cheap. That's the point. Shop online or call 877-741-COOP to place an order or just ask us a question. And finally, we are serious about great customer service. Just check out our Facebook and you'll see. Our whole crew says thank you for shopping our coops! Practical Meets Pretty. 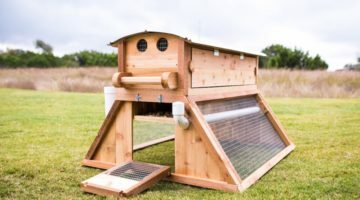 It's Like a Chicken SUV for up to 10 hens... keeps a family of 4+ fed fresh eggs! Stealth size and a much better way to do mobile for up to 4 hens! Shhh. What the neighbors don't know can't hurt them. 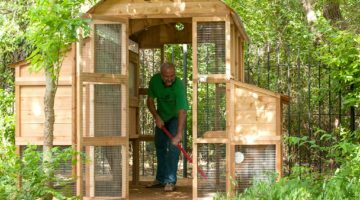 Keep up to 6 hens in this roomy little paradise for you and your chickens and give your back a break. It's what happens when you indulge. Keep up to 25 hens in ultimate style and function and make care a breeze. 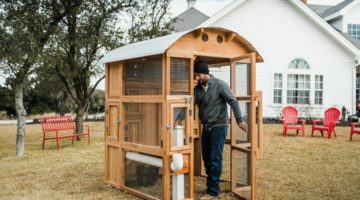 Urban Coop Company builds handmade cedar backyard chicken coops and ships them to your door either assembled or unassembled. you can assemble with only a cordless drill and save a bundle. Thousands of happy Urban Coop Company customers give the highest ratings to our chicken coops and great customer support.